Today, the North Coast Music Festival 2016 initial lineup (with more acts to be announced) was revealed and it includes some heavy hitters. This year’s headliners include Odesza, Bassnectar, Zedd, Logic, and Grouplove. Artists such as Raury, Juicy J, Ty Dolla $ign, and the star of F*CK, THAT’S DELICIOUS, Action Bronson will all be on deck this September. 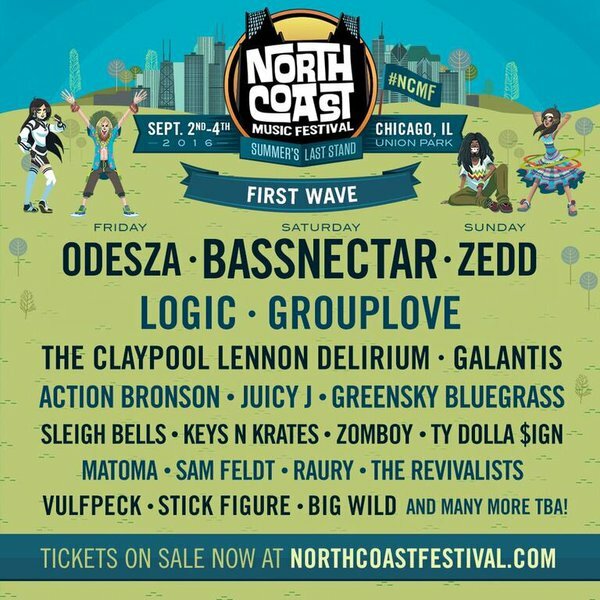 The North Coast Music Festival is presented by React Presents and returns to Chicago’s Union Park this September 2nd – 4th. 3-Day GA tickets are priced at $159, while 3-Day VIP are $259. VIP tickets allows you to enter the festival through Express Entry Gates (only for VIP ticket holders), The VIP Lounge, Reserved Viewing Stands and Lounge Seating, and more. Both GA and VIP tickets come with a payment plan if needed. You can purchase your tickets here.